The ACR filter is a unique, superior technology successfully demonstrated by many commercial operations, which uses a proprietary wire mesh as filtering medium. A key feature of the ACR technology is a rotating shaft inside the filtering element, which drastically decreases the consumption of wash oil during the automatic backwash phase, thus greatly reducing the operating costs. The shaft also ensures a very high backwash efficiency and allows the filtration phase to continue during the backwash phase. The high efficiency of the backwash is the key to the superior performance. This parameter is simply measured by monitoring the pressure drop between the filter inlet and outlet after each backwash cycle. This pressure drop remains constant and close to zero in all the operating ACR filters confirming that there is no cake accumulation on the filtering element through time. The absence of a substantial cake formation on the wire mesh allows the ACR filter to operate at a low pressure drop (about 0.5 bar or 7.0 psi) avoiding contaminant and asphaltene agglomeration. The design flexibility to sustain large variations in solids content. Because of the short time required to backwash a filter vessel (about 10 seconds), the ACR filter is able to cope with a sudden increase in the solids content simply by increasing the frequency of the backwashes. The very small consumption of wash oil (much less than 1% of the feed to the filter) ensures significant savings in operating costs and provides R.O.I. time for new investments in 6-10 months. The ACR technology can operate with all the heaviest and most viscous fluids at an absolute filtration degree of down to 4 microns. This means that no particles bigger than the specified filtration degree can be found after the filter due to a removal efficiency of 100%. No need for ordinary maintenance. More than 3÷5 years without any scheduled maintenance. Lower operating and maintenance costs reduce by 60-80% the number of valves and avoiding the requirement for a dedicated PLC. Smaller plot area 50% less than a conventional filter, allows to cope with any footprint and easily retrofits existing filtration systems. Internal and external backwashing configurations. 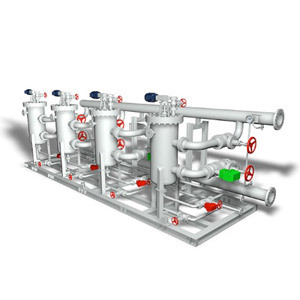 Depending on plant availability or process conditions the ACR Filters are available with both internal and external backwashing configuration. With the Internal backwashing system the cleaning phase is performed using the Filtered Feed (the wash oil has all the physical properties of the feed) while with External Backwash Configuration the cleaning phase is performed using external fluid.